FormResource: A Free Delphi Component for Organizing Product Dependencies. 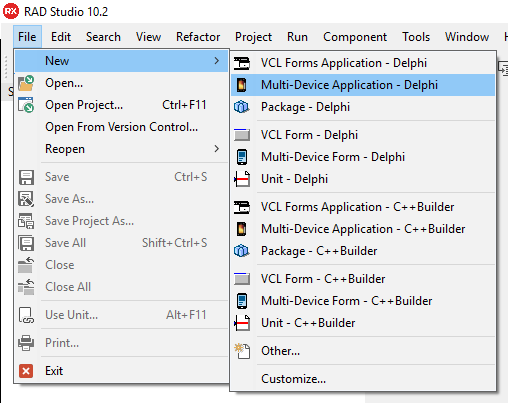 Last week I posted a tip on my blog, on organizing product dependencies in your Delphi projects for Windows. This week I’ll be giving you a cross platform alternative to that technique, and giving you a free component to make it possible. When faced with the problem of including dependencies within an executable, and in a cross-platform way, I knew that I’d faced this problem before. 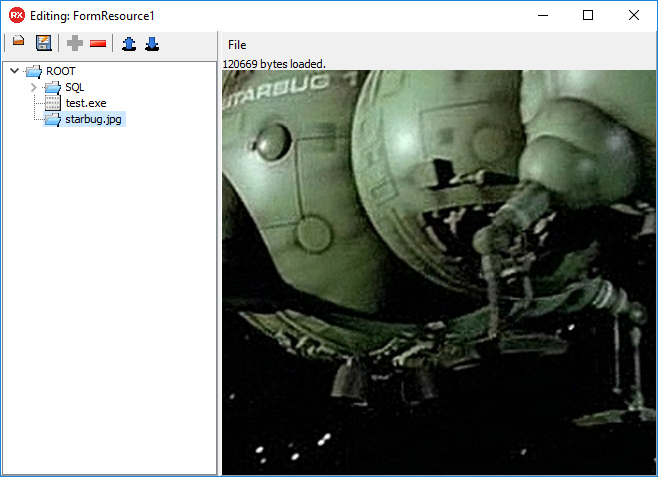 Back when I wrote a mini-series on my blog about building a sprite engine in Delphi, I’d demonstrated how to include the image resources for a game project into your Delphi project using a component to store the data within a form. I’d also built an IDE plugin which allowed you to insert your image data hierarchically into a component on a form. 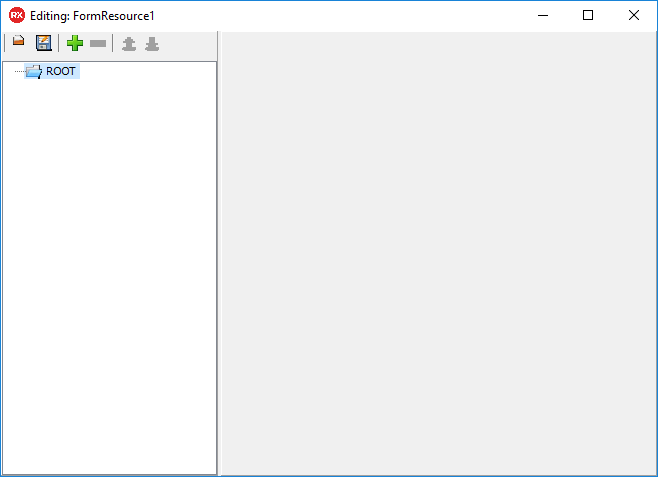 Over the past two or three days I’ve been adjusting the code from my sprite engine, to create a component named “TFormResource”. This component allows you to store just about any kind of data within a form or module in your Delphi project. Not only that, but because the component is non-visual, it should function on any supported target platform, even within a WebModule for example. The Form Resource component and associated IDE extensions are provided AS-IS without any warranty or implied fitness for any purpose. 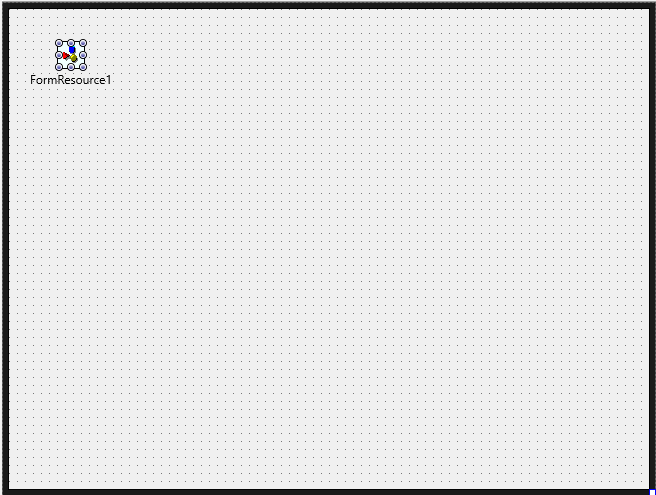 These components are provided in source code form, for you to compile and use as you see fit. These components are provided without support. These components are provided without agreement of liability of any kind. I will not be held responsible for any damages caused by your use or misuse of these components. Go ahead and start a new project. It does not matter if this is a multi-device project, or a vcl project. Nor does it matter if it is a UI application or server module, but for now, lets stick with a UI application for simplicity. 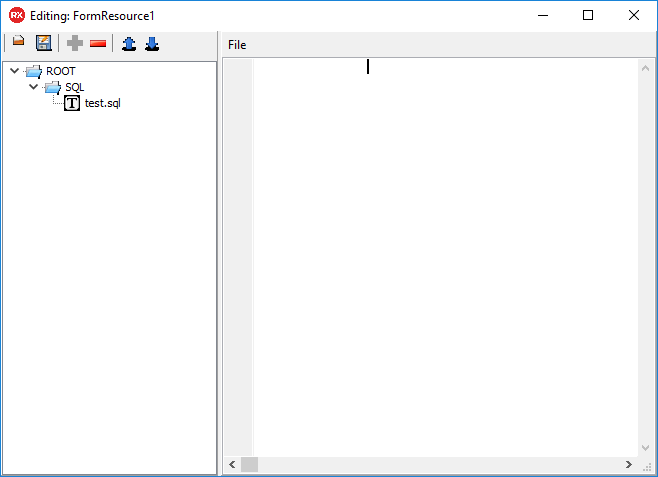 I’ll be creating a new multi-device application with a blank form..
What you’re looking at here is the root directory of a virtual file system, which is stored in the same data stream as the properties of the application form. For example, if you were to place a TEdit component on your form and set the ‘Text’ property to “Type Here”, where is the string “Type Here” stored? 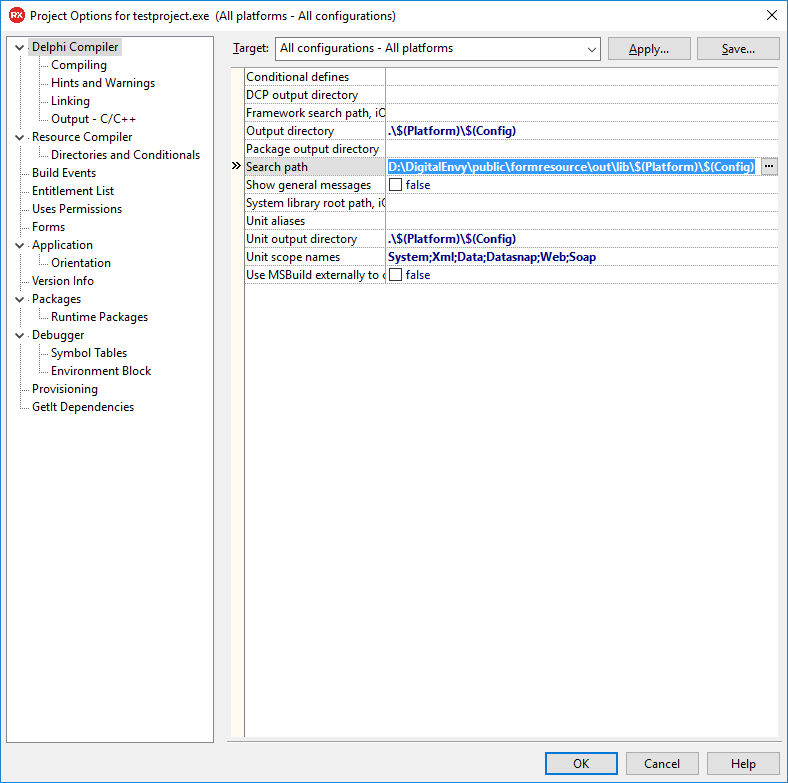 Well, Delphi streams that into a dedicated part of your application executable (the technical details of which vary among the target platforms). 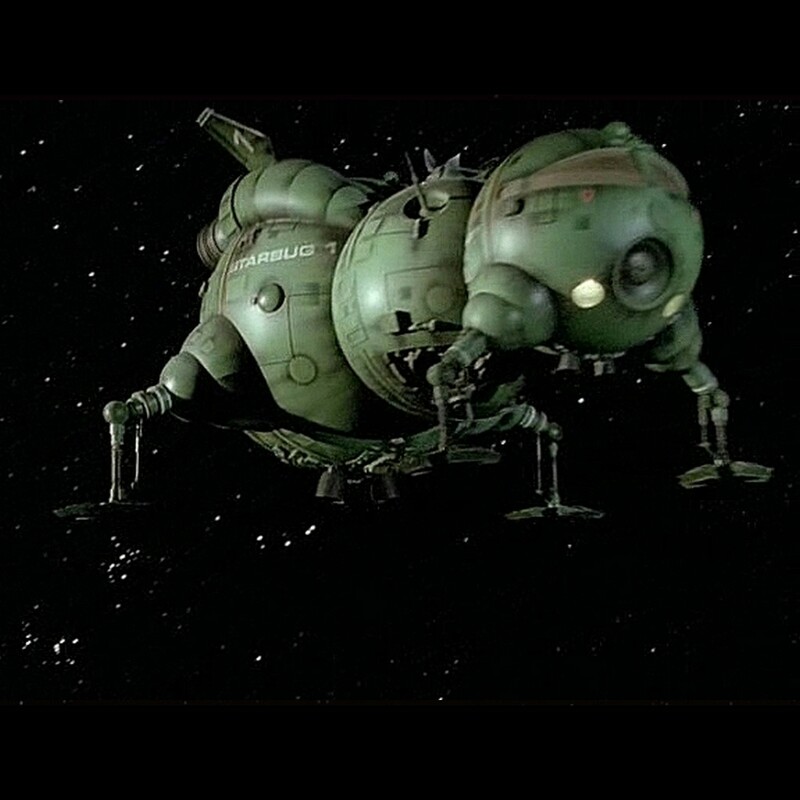 This TFormResource component will stream any data within the virtual file system to that same place. When you click on Okay, your new “SQL” directory will appear beneath the “ROOT” directory..
Now click on your “SQL” directory to make sure it is selected, and again click the “Add” button at the top. Anyhow, go ahead and close the window, and you’ll find yourself back on your application form. Looking back at the screen shot above you can see that the path to your SQL statement is “ROOT/SQL/test.sql” and we’ll need this information in a moment. 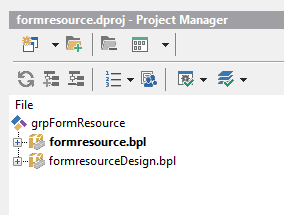 Now, before you can build and run the project you need to add the FormResource lib directory to your search path. On the left, make sure “Delphi Compiler” is selected, and then set the “Search Path” option to the location of the lib directory for your copy of FormResource. (If you’re not sure where that is, revisit the installation notes, on my system the path is “D:\DigitalEnvy\public\formresource\out\lib”) Extend the path with “\$(Platform)\$(Config)” so that the project will compile for any target for which you’ve compiled FormResource. Congratulations, you just loaded a SQL statement into your project from the FormResource virtual file system, built right into your application executable so there’s no need to distribute additional .sql files. Select your binary file and on the right pane you’ll see “0 bytes loaded” beneath a File menu. I now have some 243,200 bytes loaded into my ‘test.exe’ file, the entire notepad executable has been loaded in for me and will be stored as part of my application form. Never the less, the data is there and can be accessed using a simple TStream, which means you could easily write the file from your form back out to disk. 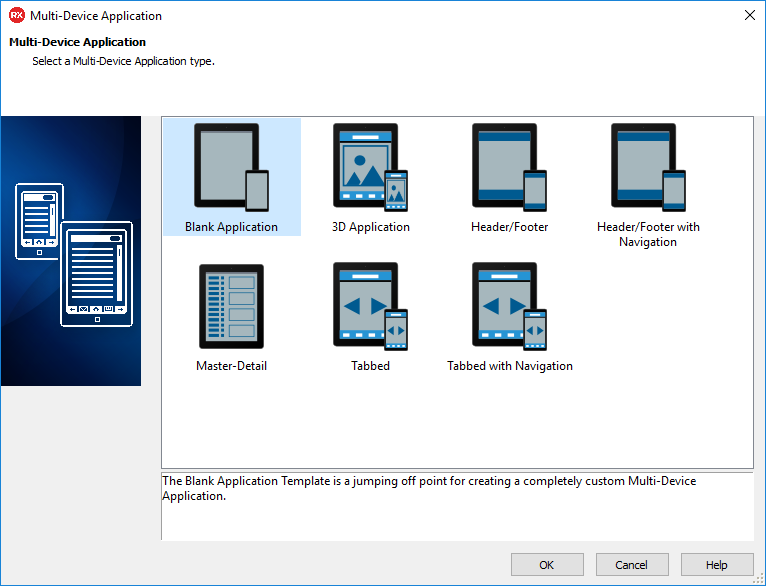 Therefore, you could use this to build a rudimentary installation application, which deploys the .dll files required by the application at run time. Or perhaps you have some other data you’d like to inject into your application? Note, currently the image display pane does not scale the image, and therefore this image is stretched too large to be viewed in fully within the editor. I plan to correct this in a future update. Load – This allows you to load a previously saved virtual file system into Form Resource from an external file. Save – This allows you to save your entire virtual file system from Form Resource to an external file. Add – Adds a new item as a child of the selected item in the directory browser. 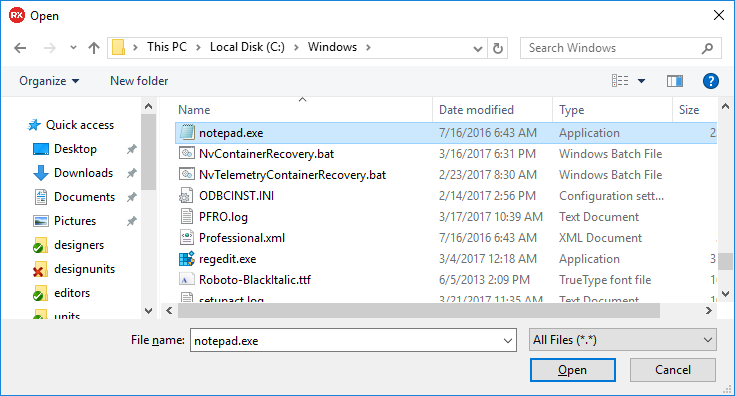 Remove – Removes the selected item from the directory browser (including children). 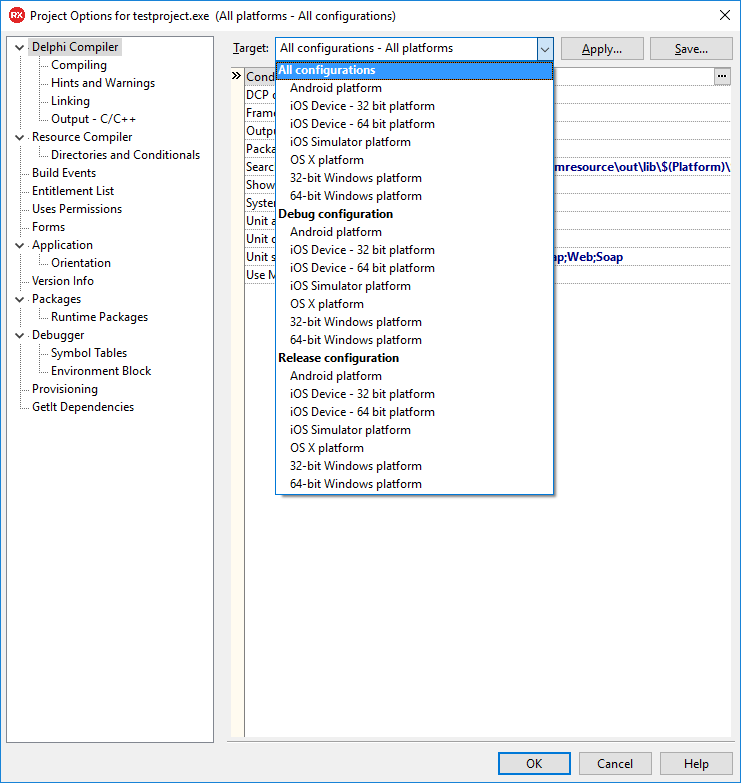 Move Up – Move the selected item up relative to it’s siblings within it’s parent directory. Move Down – Move the selected item down relative to it’s siblings within it’s parent directory. This component has some good uses for isolating assets from your source code, however, that comes at a cost. Each time your form loads, it must load all of the resources into the Form Resource component. This could increase load times for your form within the running application, as well as within the IDE. Be sure not to overload a form with too much data. There are a number of features that I would like to add to this component. At this time I can’t make a commitment to do so, because I simply don’t know that I’ll have the time. This code is entirely open however and so you are welcome to update or alter it as you see fit. Perhaps you’d like to add features and submit the delta to me for inclusion? Assuming I get time to add features, here are some of the features I’d like to add.. Enhance the directory browser to be a little more intuitive. Encrypt data as it’s saved to the form. Dynamic loading – Is it possible to load only the asset I need when I need it at runtime? I hope this component is useful to you, and if it is, I ask for nothing in return except that you consider sending me an email with the subject “Thanks for FormResource” to craig [dot] chapman [at] embarcadero [dot] com. 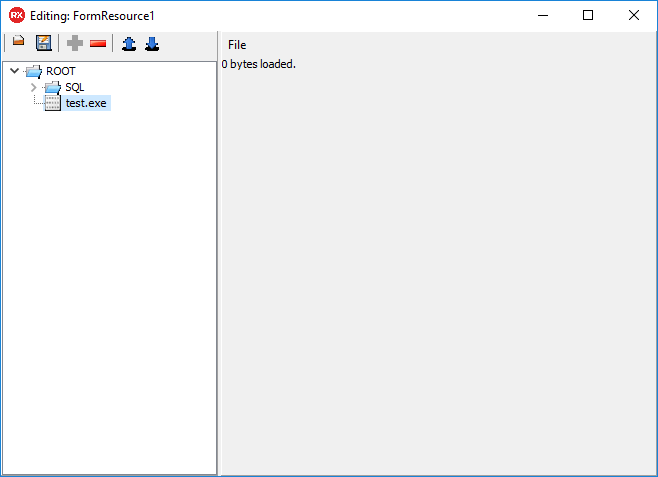 Note: FormResource has been tested to install correctly under RAD Studio 10.2 Tokyo. It should install without issue in at least RAD Studio, Delphi, C++ Builder of versions 10.1 Berlin and 10.2 Tokyo, your success with other versions may vary. I’d appreciate a comment on this post if you try it on other versions with success, or a note about any error messages given should it fail. 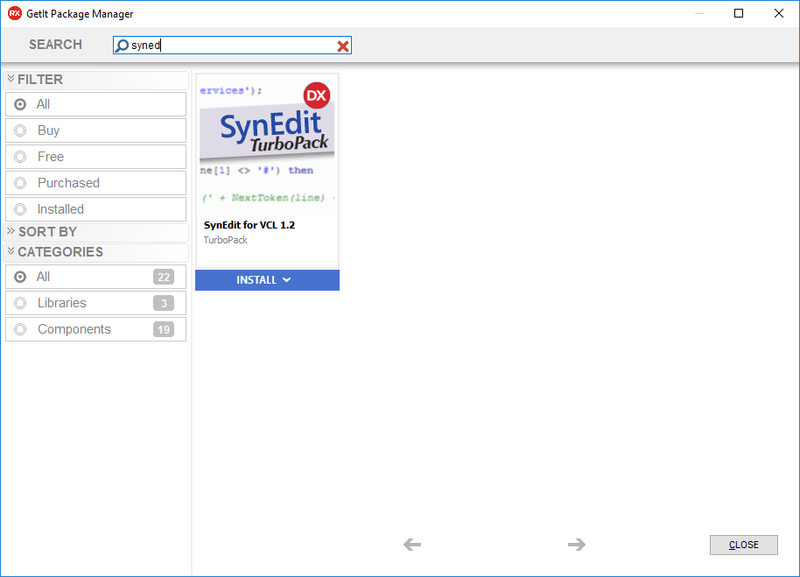 Click install and follow prompts to install SynEdit. 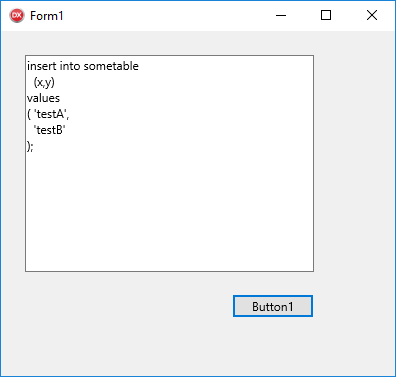 Installing Form Resource (Step 2) – Obtain source code. You will need a subversion client in order to download it. If you’re not sure how to use a subversion client, I’d suggest you consider installing TortoiseSVN and doing a little reading online to see how to use it. 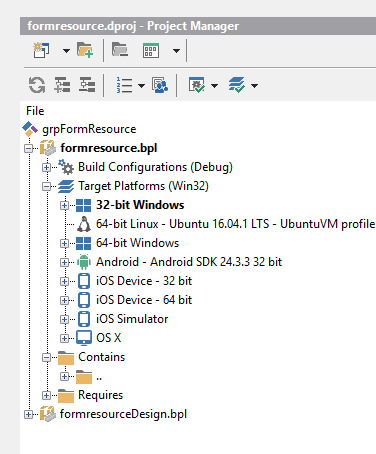 Installing Form Resource (Step 3) – Build Packages. Repeat this for each target platform that you intend use with FormResource. When you have built all of your desired target platforms, switch back to the “32-bit Windows” target and then right click the “formresource.bpl” item and select “Install” – If all goes well you should see the following dialog. You should see the following dialog. Congratulations, Form Resource is now installed. Very interesting concept. I do see a few things that could be improved. First, the data is added as a binary blob, which is fine for binary data, but if your adding SQL and using version control, it is very helpful to see what changed between revisions…something that the resource approach works better for. Maybe having an option of how the data is stored as a property would give more flexibility. 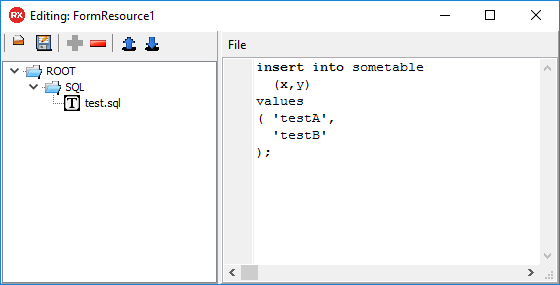 Added a property ‘AsString’ to TStreamableResource which converts the stream to/from a string. This should only be used on text resources, it will do bad things for binary resources. 1) Sometimes when you close the designer, the IDE does not recognize that there have been changes to the content of the FormResource component. 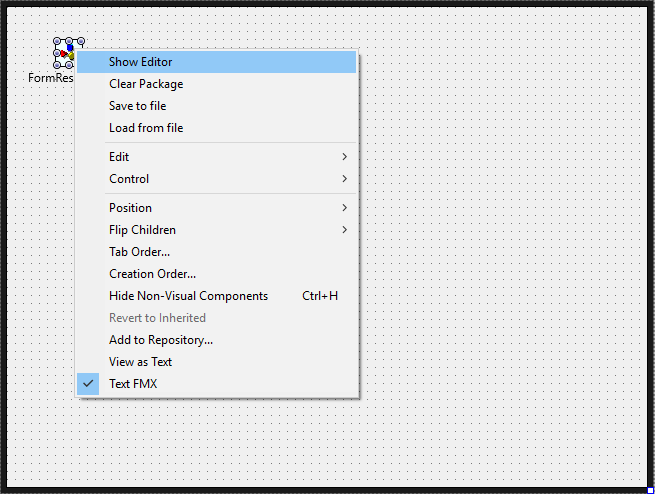 WorkAround: Move the component on the form to cause the IDE to recognize the changes and then save the form. 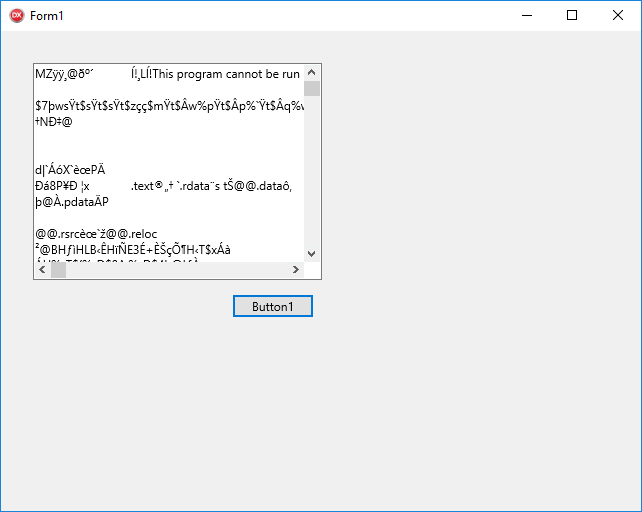 Cause: Unknown, may be a bug in the IDE. 2) Many keyboard accelerators don’t work. This is irritating but does not impact functionality. 3) I have had an access violation when deleting a directory. Still need to investigate.